What does the museum do? Why do they do it? How does it get done? The Noble Corporation and Noble Energy Orientation Gallery answers these questions – and more! This interactive gallery provides insight into the behind-the-scenes work of our museum’s collections and research departments. Learn about the ongoing research of museum scientists as you browse some of the most spectacular specimens and artifacts from our extensive collection. As you enter, say hello to Sauroposeidon proteles, the world’s tallest dinosaur. The 40-foot-long neck and skull peek into the museum’s Great Hall to greet visitors. Like many of our visitors, this dinosaur is an Oklahoma native. In fact, several neck bones of this one-of-a-kind specimen were unearthed in southeast Oklahoma in 1994. 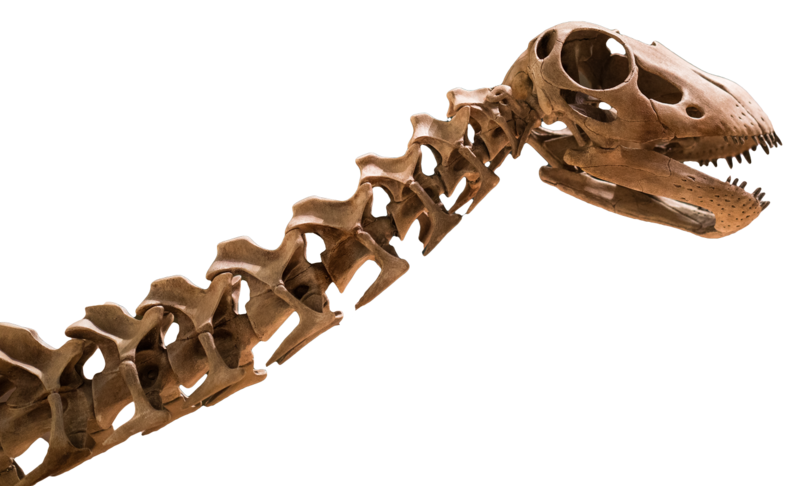 Each neck bone measures more than 3 feet in length, but is surprisingly lightweight. In some places, the bone is no thicker than a fingernail! Whether you are learning about Oklahoma’s prehistoric past, fauna of the present or the museum’s future research endeavors, the Orientation Gallery is the perfect place to begin your journey at the Sam Noble Museum.